Ever since Nike+ came out, I wished that Nike had less to do with it and Apple had more to do with it. The bulky flash website that was so slow to download had Nike’s fingerprints all over it and I wished for something solely run by Apple. Then Apple came out with the iPhone and my iPod Nano felt like a superfluous accessory that I only used when I went running. I can’t use my Nike+ with my iPhone, so I have kept my Nano just to log my runs. I have been wishing for the Nike+ to work with my iPhone. If I had been wishing that Apple would create their own system, I would have had my wish granted. 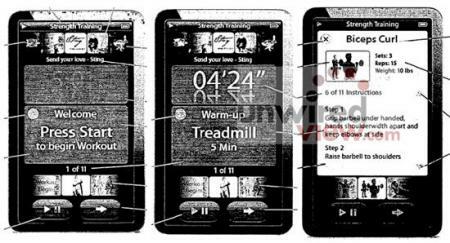 Apple has filed SIX patents on a “Lifestyle Companion”. 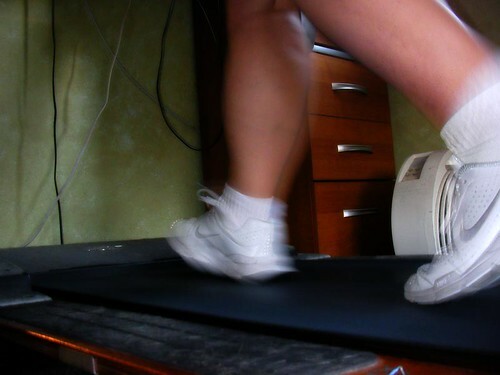 Not only will it communicate with a sensor on your shoe, but it also communicates with exercise machines so that if I run five miles on a treadmill, it doesn’t have to approximate with the sensor, it can get the information directly from the treadmill. It also can track your eating and nutrition. Suddenly, all my hatred for Nike is allowed to run free. Their XL workout gear that will only fit those who are underweight, their slow and cumbersome website, and their overpriced sensor replacements for the Nike+ can all take a walk off a cliff. It might be years before these patents become a product for me, but I’m willing to wait. When Apple does things, they do them right. Via: The Joy of Tech comic… laughter is the best tech support. Most runners have experienced positive feelings from running. I know I have. It’s not every run, in fact, it usually only happens about every other week, but sometimes I finish a run and feel better than when I started, despite the effort. Even though the reports of runner’s high date back dozens of years, scientists have never been able to prove that something physiological was benefiting the mind until now. Dr. Boecker developed a less painful way to test his hypothesis that runner’s high is caused by opioids. In his study, which appeared in the February issue of Cerebral Cortex, Dr. Boecker injected runners with radioactive isotopes that bind to opioids. Then he PET scanned subjects before and after a two-hour run, finding elevated levels of opioids in the frontolimbic regions of the brain that regulate mood. Opioid levels directly correlated with self-reports of the intensity of euphoria, establishing a clear link from running to opioid release to feeling good. I miss running. I haven’t run for the last couple of months because I’ve been playing DDR instead. I love playing the dancing game, but reading this article reminded me of how awesome a good run can be, even if it only happens every couple of weeks. Sutherland Studios, however, has step-by-step instructions on how to make a similar bracelet. They suggest that you could use the bracelet to keep track of rows of knitting or crochet, but this would be genius for discretely keeping track of your Weight Watcher points. Since you are making it yourself, you can put the number of beads for YOUR points limit. The second string, with additional charms, could keep track of your veggies, dairy, oils and water. I imagine five green beads for veggies, six green beads for water, two white beads for dairy and two clear beads for oils. Because you make it yourself, choosing your own beads, no one would be able to tell that it was for keeping track of Weight Watcher points. You could just privately move over the stretchy bead when you eat your meal unnoticed. 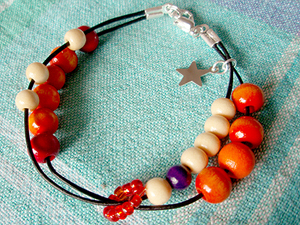 If you make a bracelet such as this, post a message in the comments linking to yours and show off your talents! I was reading the retro advertisement blog, Found in Mom’s Basement, and I saw this ad for Spam from 1975. I was six years old in 1975. I loved Spam. Looking at the picture of Spam and eggs reminded me of how much I loved Spam. Now, I don’t really consider Spam food. Just like styrofoam or crayons, sure you can chew and swallow it, but it’s now categorized in the “Not Food” category. When did that happen? Nutrition facts. I’m pretty sure I classified Spam as “Not Food” when I could actually see how much fat and how little meat there was in that can. Logically, that makes sense, right? It must have been when I saw the nutrition facts. 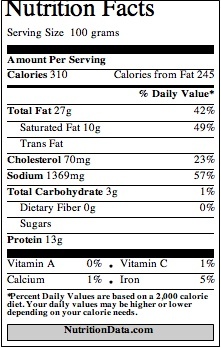 The truth is, the nutrition facts for Spam look pretty bad. According to NutritionData, Spam has almost twice the calories and fat than regular ham. When we were kids, Spam was considered the coolest food. Just look at the ad showing it used in so many different situations. Although my parents never barbequed it or put it on pizza, I’ve eaten spam in casseroles, with eggs and on sandwiches. We always had a can of it in the cupboard, just in case. All of this has me thinking. 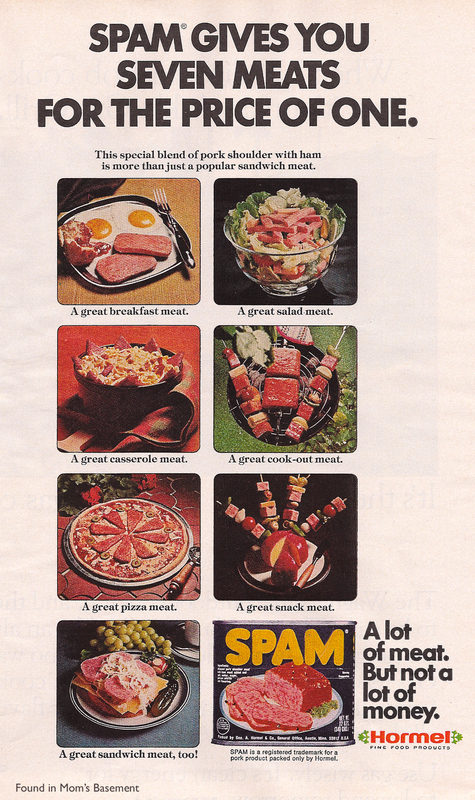 If Spam was a perfectly cromulent food in 1975, what food of today is going to be the Spam of tomorrow? Flax seed cereal? Cabbage soup? Whole foods in general? Whatever the food fad of today, there is certainly going to be a backlash for it later. Our definition of food is constantly changing and it’s hard to keep up. Poor Spam just got caught in the crossfire between marketing and nutrition. Once again, Tom Mangan shows us why it’s important to keep physically fit: so you can hike the beautiful trails of Murietta Falls and enjoy the splendor. 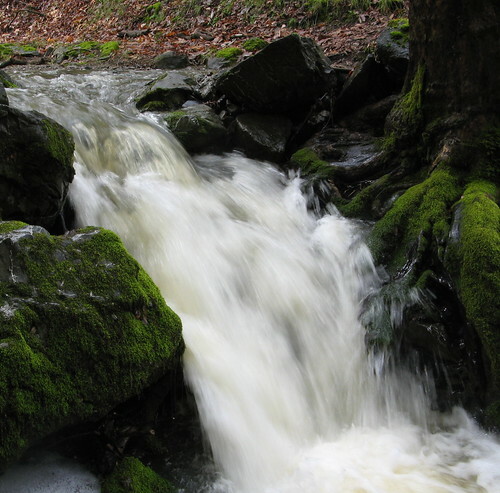 For those unfamiliar with the pleasures of hiking to Murietta Falls: Itâ€™s about six miles one way from the Lichen Bark Picnic Area at Del Valle Regional Park near Livermore. Getting there entails one epic climb on from the parking lot to Rocky Ridge, then going downhill to Williams Gulch, then slogging up for another epic climb on the Big Burn (steep, yes, but also one of the prettiest stretches of single-track trail in the East Bay.) After that you go back down a few hundred feet in a mile to the Falls, including a harrowing bit of iffy footing just before you reach the base. Then you go back the way you came. A side trip along the Rocky Ridge Trail adds about a mile each way, but you avoid a really steep patch of trail and get some great scenery. The stereotype for someone with an eating disorder is a young teen female, but it appears that women aged 30-50 are also at risk. Dr. Pryor tracked patients at the Eating Disorder Center of Denver (EDC-D) over the course of two years, comparing the information of 78 younger women with that of 63 women in their 30s, 40s, and 50s. While she initially believed that the specific issues facing these women would vary depending on their age, she found that these women had similar temperaments and triggers, regardless of age. Both age groups scored similarly on tests of character, with low self-esteem and high anxiety predominating. Additionally, young and middle-aged women were affected by many of the same triggers for disordered eating, including dieting, experiencing abuse, and grieving. Part of me thinks like that older women aren’t just developing these eating disorders. We had them all along and never got treatment when we were teens. The other part of me sees that disordered eating is becoming all more common and is now spreading to all age ranges. This is the final week where I will give you step by step instructions on how to get into a swimsuit this summer. If you’re short on time, scroll down to the end and read “The Short Version” to get your weekly tips. If you HAVE been following along, your job last week was to wear your swimsuit alone at the pool. How did that work out? Did you take a couple of hours just for yourself to relax at the pool and test out your suit while it’s wet? If so, give yourself kudos and move on to this week’s final adventure. This is the week that you test out your suit with trusted friends or family members. Don’t bring along the person who will make fun of you. Only bring supportive people who will have a good time with you. Don’t tell them that you are there to evaluate your new swimming suit. Just tell them that you want to get ready for the summer season and go swimming with them all before the pool/beach gets crowded. This isn’t all about getting used to your suit. The whole reason why you want to have a swimming suit that you love is because you don’t want to miss out on the fun. Whether it’s water-skiing, snorkeling, boogie boarding or just splashing around in the community pool, you want to be where the fun is, so make sure you have a swimming suit that works for you. How did it work out? Did anyone mention something that you might have missed? Did people compliment you? How did it feel when you were swimming, lying on your towel or laughing with friends? Did it work? Yes? Great! Then you’re set for the summer. If it didn’t work out, however, there is still time for you to get back into the store and start all over with Week 1 again. You deserve to have a swimming suit that looks good, feels good and covers you well this summer. Don’t let yourself miss out on all the fun just because of a yard of fabric. Get out there and enjoy the summer! Give yourself kudos for getting this far. Go swimming with friends or family. Bring only supportive friends and family. Leave the person who makes fun of you at home. Evaluate your suit. If it’s not perfect, go back to week 1 and try again. There is enough time to break in another suit if you have to before summer. This postcard showed up on PostSecret this weekend. I originally thought that the numbers assigned to the forks represented dates, but then 0-6 isn’t a date. What do the numbers represent? 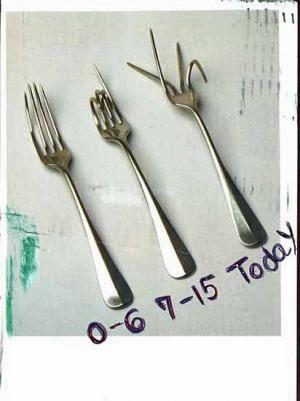 Because they are forks, I immediately thought that they represented disordered eating. What do you all think? What is the solution to the Three Forks Enigma? Something about Paul McKenna smacks of charlatan to me. I don’t know what it is, but he doesn’t seem like someone I want to trust. He has a new show on TLC and here are some highlights from the first episode. The thing that bothers me is how much this show feels like an infomercial. The clapping at the “appropriate” times and the weighing of the studio audience really feel like parlor tricks to me. The before and after pictures and the pants from a previous life are all the same things I’ve seen before. Eat what you want, not what you think you should. Eat CONSCIOUSLY and enjoy every mouthful. He uses the SAME hunger scale that Weight Watchers uses. I don’t know where this scale originated, but it isn’t anything revolutionary. Because he is recommending the same views about food that I have, I really WANT to like this guy, but something about him sets off my B.S. Detector. I can’t put my finger on it, but I don’t want to believe in anything he says, even when he’s preaching common sense. There are a few nutrition scales on the market. Do you have any idea if they are useful and which ones are worth looking into. Every website about weight loss speaks about food diary and self monitoring, this appears to be an accurate method. My first thought was: What the heck is a nutrition scale? When I did a Google search for the words “nutrition scale” there were SO many entries for companies selling food scales. They are compact little scales that can tell you how much food you are eating. So if the nutrition facts on the back of the package say 1 ounce, you can weigh out 1 ounce. I have one. I use it to weigh the Walking DVDs and Yearly Journals that I send out every month. Okay, every once and a while, I use it to weigh food to make sure that I’m still eyeballing things right. 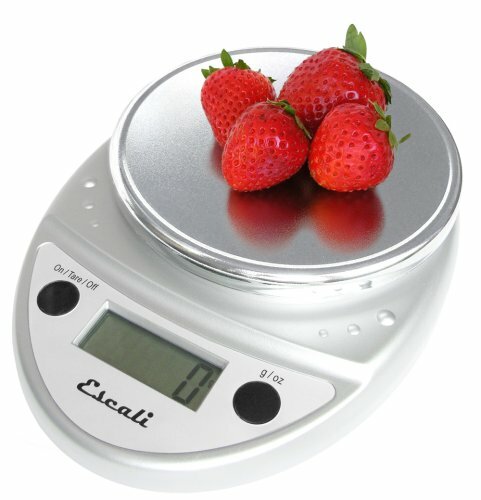 Mine is made by Escali and it looks very much like this Escali Primo Digital Multifunctional Scale. My sister gave it to me when she cleaned out her kitchen. It runs on batteries and I have never had to change them. The thing that worried me is the price of these gadgets. They range from $20 to nearly $300. My scale was the cheap twenty dollar version and works wonderfully. Why would anyone need a food scale that is almost three hundred bucks? I can understand the cost of a scale like that if you worked in a research laboratory, but for weighing your food at home, an inaccuracy of a tenth of an ounce isn’t going to make or break your diet. In fact, the whole idea of meticulously weighing your food just seems wrong to me. Eat enough to stop being hungry and not too full. If that means leaving a bite or two left over, fine. Give it to the dog, throw it away or save it for later. Seeing all those listings for companies that are selling “nutrition scales” just seems like they are trying to profit off the diet industry. If you do desperately need to weigh your food, a twenty dollar scale should be perfect. Don’t waste your money on anything more elaborate than that. The email reply that I sent to “Valarie” bounced. I suspect that the email I received was a pathetic attempt by some misguided company to create a viral marketing desire for “nutrition scales” and to profit from the diet industry.